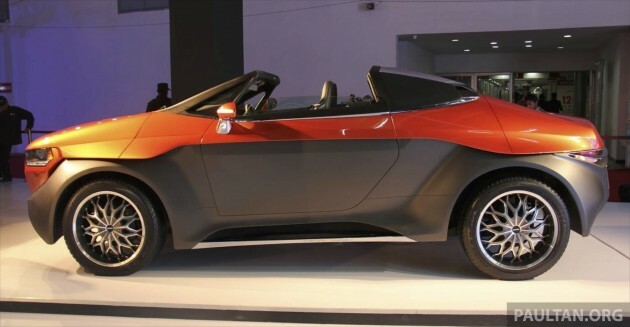 It’s called the Eleron, and it’s a targa-topped SUV from Indian outfit DC Design. The concept, which debuted at the Delhi Auto Expo 2014, is the brainchild of Dilip Chhabria, who is best known as the designer of the Avanti sports car. The two-door, four-seater Eleron features a carbon composite body, and sits on a space frame with a roll-cage. Measuring in at 5,055 mm long, 1,965 mm wide and 1,710 mm tall, with a 3,090 mm long wheelbase, it’s powered by a 2.0 litre turbo offering 265 hp and 360 Nm, presumably a Ford EcoBoost unit. The mill is mated to to a five-speed automatic transmission. There’s all-wheel drive, ABS, all-round disc brakes and a front double wishbone/rear air suspension system in the mix, and performance specs include a 200 km/h top speed and a 0-100 km/h acceleration time of 9.0 seconds. Word is that DC Design intends to bring the Eleron into production by 2016. Live photos of the DC Eleron concept courtesy of Faisal from Motorbeam India. The design? Like this car can float on water…kah..kah..kah..
what manner of abomination is this??? Ugly design. Camry steering wheel and VW gear knob.. weird. With 265hp.. 0-100km/h in 9secs??? what a joke. Next Post: [AD] Ban Lee Heng Motor opens new Honda 3S centre in Melaka: offers attractive rebates and freebies!